Nearly everyone has heard of Helena, Montana. It’s one of those last stops before you enter Canada that often feels like it’s too Northern to remember. We think of cold and ice and long winters, and figure those that live in Helena must be a tough bunch. Very few of us know how Helena came to be, but if we knew the story we would understand that toughness, does indeed, run in their veins. It was all the way back in 1864 that Helena, Montana was first founded by four miners that happened to finally get lucky. Each of the four miners had travelled together all the way from Georgia and later became known as “the four Georgians.” Helena itself was the very first Anglo settlement within the Montana Territory and was settled by the first few settlers in 1862. It was during this time that prospectors in the area managed to find some significant placer gold in Grasshopper Creek. After the first finding, other richer deposits were discovered in the surrounding areas. These findings led to quite a gold rush and what was once a tiny settlement quickly grew to home tens of thousands. All of these miners came to the area for one thing – gold. It wasn’t until 1864 that the, now quite famous, founding fathers made their way to the area. These four travelers first headed through the Kootenai area only to be disappointed with their findings. Having heard about the success further south they headed back down to give mining one more shot. They set up and staked their claim, appropriately naming it “Last Chance Gulch.” After failing miserably elsewhere they had decided to try one last time, if they failed they were to head back home. Lucky for them they managed to find a significant amount of placer gold. To their great fortune, Last Chance Gulch would eventually become the second largest placer gold deposit in all of Montana. Turns out their last chance was a real winner. The gulch ended up supplying more than $19 million in gold over just four short years. With this massive discovery the onslaught of other miners commenced. Thousands of other eager miners arrived in the area nearly overnight ready to strike it rich. With the arrival of thousands the original four founded Helena and began building a true city. Now when others arrived they would find food, housing, and plenty of supplies to keep them going. The one thing that has separated Helena from other popular gold rush towns is that it managed to survive even once the big deposits dried up. Other towns throughout Montana seized to exist once the miners disappeared. It should also be noted that Helena was not the first choice in a name. Many other names were considered including Pumpkinville and Squashtown. Lucky for Montana they settled on Saint Helena after another nearby town but eventually shortened it to Helena. Helena continued to thrive due to its location along several main transport routes that helped it to grow by providing a steady influx of agricultural products and other necessities. It was also near to other smaller mining towns that would use Helena as a hub for their own supplies and in 1875 Helen became the capital of what was then the Montana Territory, and in 1884 the first Northern Pacific railroad line arrived in the town. When Montana became a full-fledged state in 1894 the city remained the capital though not without a fight. There was a battle in 1894 when many believed the city of Anaconda should become the new capital due to its own booming mining. Helena and Last Chance Gulch, always lucky, won out and remained the state capital. Although the height of mining activity is long over at Last Chance Gulch, there is still gold in the area. In fact, downtown Helena was built right on top of rich placer ground that would still contain gold if there weren’t homes and building sitting on top of it. This part of Montana still has other rich mineral deposits. Many surrounding areas have also produced gold. To the south is the city of Butte, which was considered to be the “richest hill on Earth” due to its massive copper deposits. 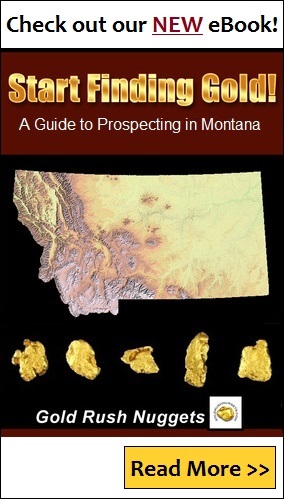 Gold prospectors will be right in Helena and throughout Western Montana.